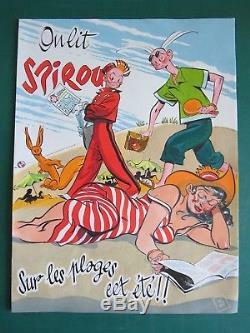 Great original illustration on the theme of a spirou tribute by al severin "we read spirulos on the beaches this summer" (size 36cm x 27cm), superbly executed in Indian ink, gouache and watercolor, and signed al69, in bottom right. 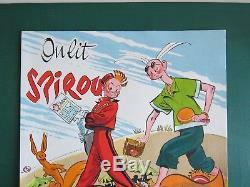 This illustration is enhanced by the presence of spirou, fantasio and spip, among other characters. Piece of superb hold and freshness, perfectly preserved. Happy bidding and thank you for viewing my other sales, listed by categories in my shop. For the rest of Europe sending with same international support and insurance. The item "Original ink / gouache / watercolor tribute to spirou signed al severin" is on sale since Saturday, September 1, 2018. 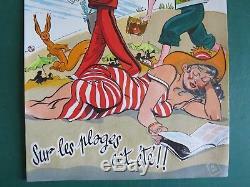 It is in the category "books, comics, journals \ bd \ boards, original drawings". The seller is "letopsinonrien91" and is located in / in paris, île-de-france. This item can be shipped to the following countries: Europe, United States, Japan, Canada, Australia.